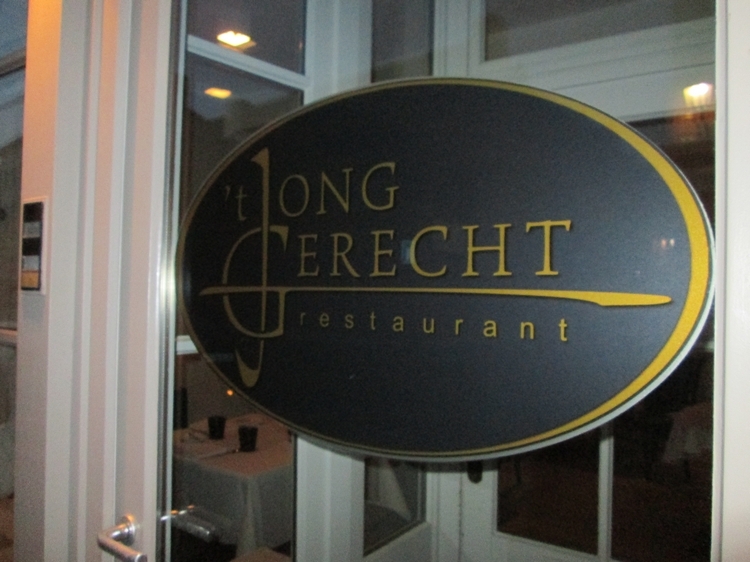 Restaurant review #12 – ‘t Jong Gerecht is located in the Langestraat near the Kruispoort. The restaurant is run by staff who are all in their early twenties (hence their name ‘Jong’ = young). The restaurant’s name also refers to the Court House (= Het Gerecht) opposite to the restaurant and ‘gerecht’ also means ‘a dish’. I mailed ‘t Jong Gerecht a couple of weeks before, to ask whether we could get a vegan menu (explaining what we do and don’t eat). They swiftly replied that this was not a problem, since they also for example use algae (agar agar) as a binding agent. They do advise to make the reservation two days in advance, so they can take our vegan wishes into account. And so we did. We were seated at one of the tables for two, in the back of the restaurant, next to the open kitchen. The waitress came to put some some bread and butter on the table (classic mistake, which we’ve experienced often at restaurants) to which I said that we asked for a vegan menu, and she apologetically took it away. 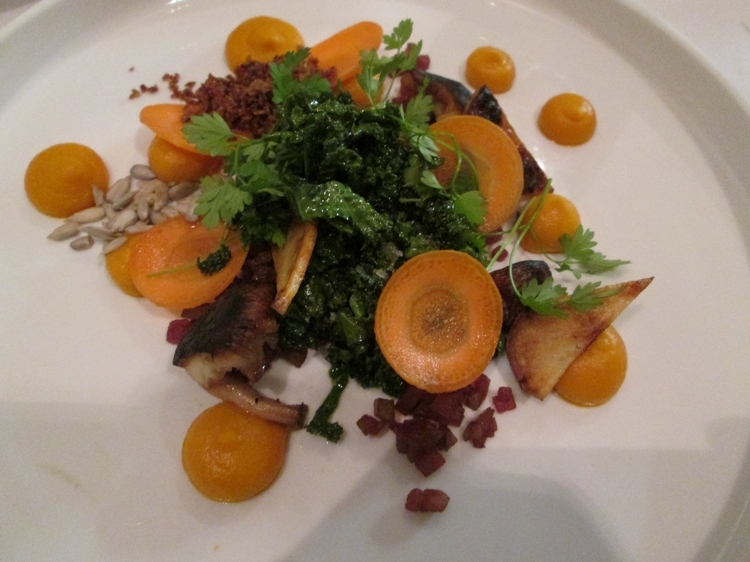 After a short while, the chef came to greet us personally and elaborated on what he had in mind for the vegan menu. He explained that they use agar agar and bake the bread themselves (no animal ingredients). He also said they could make a vegan menu without heads notice, but it is advisable to request it in advance so the kitchen is well prepared. It was nice he took some time to come and talk to us personally, and he had no problem with answering our questions. It gave us a reassuring feeling. The 3-course menu is 39€ and the 4-course menu 45€. We went for the latter. The sommelier offered us a bottle of white wine of Jean-Francois Merieau, and specified it was clarified without using proteins. 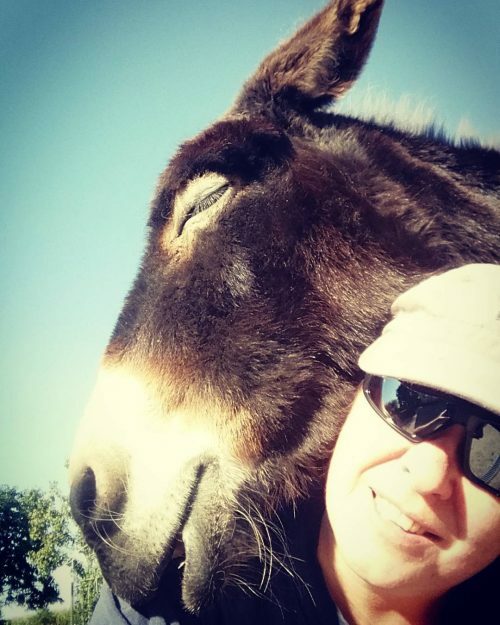 We were surprised she even mentionned this, as we’ve asked many Belgian wine dealers before if they have vegan wines on offer, and nearly all of them looked at us like if we came from planet Vega (meaning: they have never heard of such a thing). In retrospect, we should have asked how she knew this, because afterwards we saw this brand is not listed on barnivore.com, nor is anything mentioned about it on the company’s website. Finding vegan wine is one of the more trickier things, both in the shops and during restaurant visits, because hardly any brands carry a clear label (one a side note: obviously, if you want to be 100% sure: don’t drink any wine at restaurants). Then we got three main dishes, with a small dish of couscous and almonds as an in between. The main dishes were nice, creative and diverse, although the pumpkin mousse and carrots were predominantly recurring in two of the dishes (you can also see that on the photos). These were the desserts (yes, we got two!). We specifically asked what the orange ‘cream’ was made of, and it was said to be only made of orange juice. 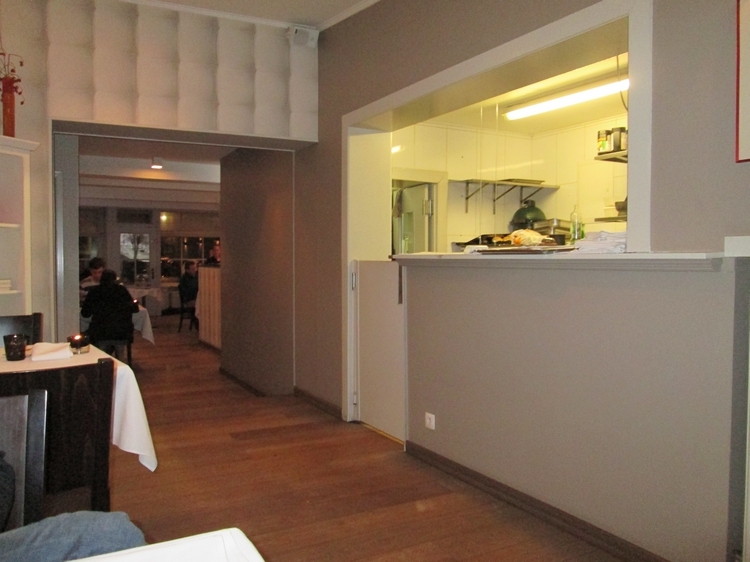 When making the reservation, we suggest you ask whether it is possible to sit in the front room of the restaurant. We were seated at the back, next to the toilets, and the kitchen’s storage room, which entailed a lot of people walking back and forth. A couple of times we also noticed the stench of baked fish coming from the open kitchen, since we were seated right next to it. Of course we realise this is not a vegan restaurant, and we are aware that you are confronted with animals on people’s plates on the surrounding tables anyway. But maybe in the front of the restaurant, the confrontation with the smells from the kitchen would be less. We encountered a combination of eager enthousiasm and a tad of youthfull nonchalance, which could benefit from some further finetuning. Chairs are not really comfortable for long dining, but service was swift and all courses were served in more than reasonable sequence. Creative and very nice culinary experience. All in all an enjoyable evening, good value for money, and we would definitely like to visit again!